These are display slightly differently and have positives as well as negative out comes. Let’s look at these different settings in detail. Start by drawing a couple of walls similar to the image below, I am using UK metric template with a typical brick and block work cavity wall construction. We are going to modify the brick hatch pattern. To do this we need to access the materials. Go to the settings menu> then materials. The materials dialogue box will appear. Scroll down the material listing until you locate “Masonry-Brick”. We need to adjust the cut pattern of the material. 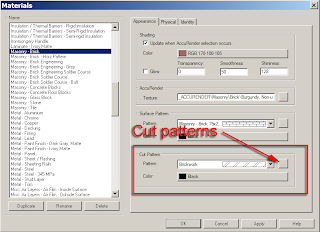 Click the button next the to the cut hatch pattern. 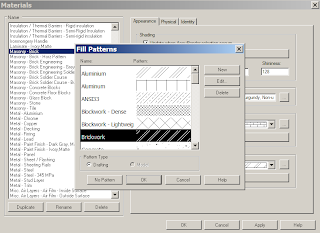 This will take you into the fill patterns dialogue box. Next select the edit button on the right hand side of the dialogue box. The modify patterns properties dialogue box will now appear. In this dialogue box you will notice a setting called orientation in host layers. There are three different settings. Let’s look at the different results from each setting in turn. Align with view always keeps the hatch pattern oriented correctly to the host element. So in the example below you can see that the brickwork hatch patterns remains at its correct orientation to the way it was drawn even when the element changes direction. The negative side of this is that the hatch patterns do not appear to clean up correctly. Keep readable will always try to keep hatch patterns in host elements which are horizontal or vertical to a view readable, thus they will always cleanup. However, if the wall element is drawn at an angle, the hatch patterns will remain readable to the angle it is drawn at, so you can see in the example below, the angled piece of wall and horizontal piece of wall do not cleanup correctly, which is what you would expect. Orient to view will cleanup all the hatch patterns, so they always display correctly in a view. This is very much how AutoCAD users would expect hatch patterns to display when hatching walls in a DWG environment. However, the negative side of this is if your wall is at an angle and it happens to align with the angle of the hatch pattern, ouch! The pattern will run parallel in the wall, which is not ideal. For more details refer to movie file. There you have it, an explanation of the three different settings which allow you to control the orientation of hatching in host layers. Each has its merits as well as its pitfalls; you need to choose which one is suitable for your project on a case by case condition.